As the day teetered towards twilight, the thunder of an overhead train on an otherwise stormless summer night silenced the group. In a synchronized movement, we all stretched our heads upward to make sure that the freight, at least 5 stories above us, wasn't heading straight for the platform we were lounging on. The height of the train tracks was comparable to the buildings that surround us in the city, but the embracing trees, river, and serenity of the night was foreign, entrancing, and very unlike home. My husband and I curated a show in July at One Mile Gallery in Kingston, NY, and we were lucky to have Matt Phillips as one of the artists in it. He, along with a handful of other painters in the show, came up for the opening. 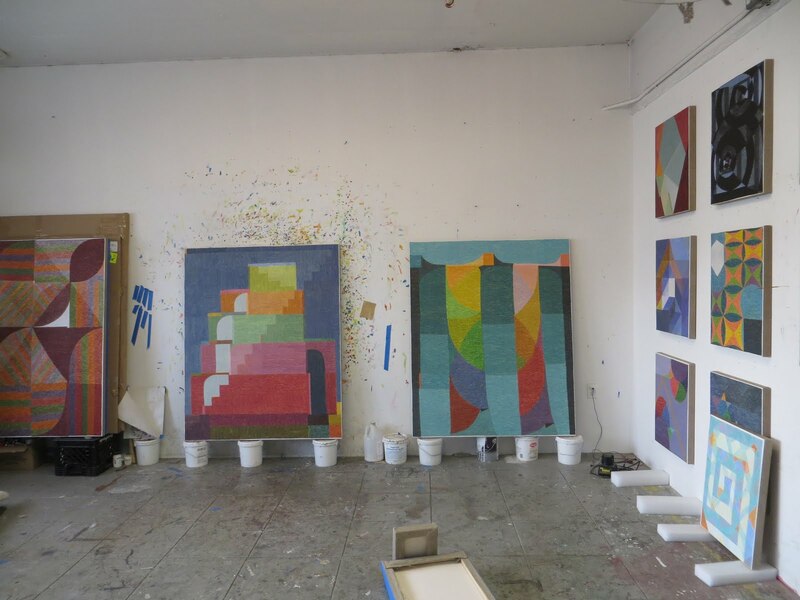 When I visited Phillips' studio months later, he shared with me two paintings that were inspired by that night and the percussion of the train. The structure's mysterious hugeness was captured in his canvases and so was our joined experience. 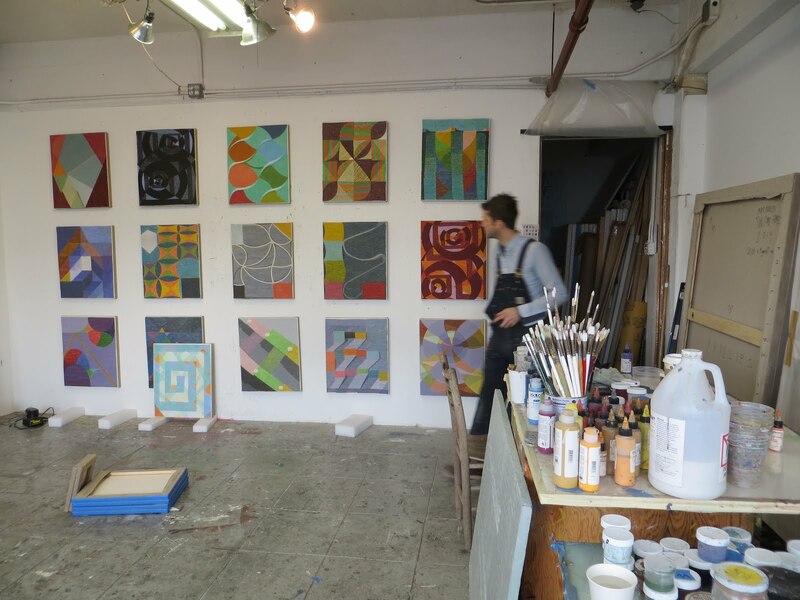 Phillips asked me if I wanted to arrange the paintings before I got started. 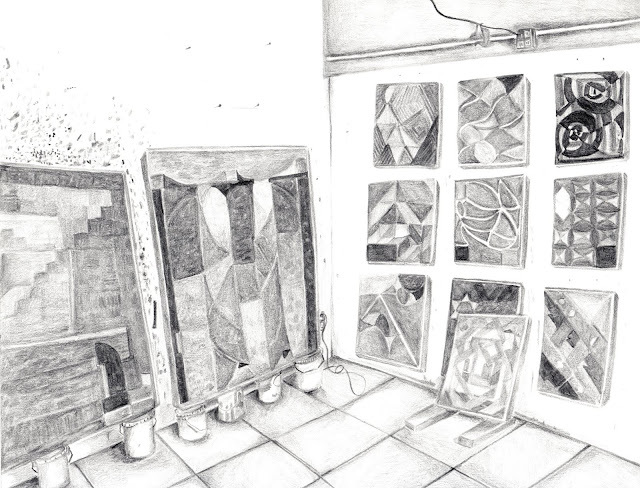 Curating a studio for a drawing is such a thrill. The work was leaving for Matt's double feature solo show at Steven Harvey Fine Arts in less than 48 hours, so, as you can imagine, the pickings were as rich as the paintings. With multiple points of entry, Phillips' work is generously made. The larger canvases, which often depict familiar fantastical structures straight out of a sixties psychedelic animation, beg for being climbed on and around, making a playground for the eye. The paint that is applied to fill these shapes, in both the larger and smaller paintings, pools together at their edges creating rivers of vivid color. The organic quality of these ridges gently persuades you to take time to look, resting your eye on their furry details. Phillips makes his paint by hand, allowing for it to have the right viscosity to play this game of chance on the canvas. I talked to Matt about how he arrives at his overall patterns, and he explained that he listens to the paintings while he makes them. You can see this in their differences and individual voices. There is an ethereal glow to the work, as there is to the artist. I haven't mentioned Mirabelle yet. She is Matt and his wife Molly's dog, and she is like no other. My adoration for her goes deep. If you get the chance to meet her, do so. Her gentleness and magnetism can only be matched by her owners. Mirabelle spent the day with us watching and listening; the perfect studio companion. Make sure to see Matt's fantastic solo show at Steven Harvey Fine Art Projects. Matt is also currently in a group show at Bannerette, curated by Austin Eddy. Matt will be at MacDowell for the month of January. And if you find yourself in Paris, check out the group show at Le Coeur, curated by Timothée Chailou, opening in February. To see more of his work go here http://paintingpaintings.com/home.html .